Grief and betrayal have to be two of the most profound emotions, outside of love. It is because of intense love that grief and betrayal have such an enormous effect on a person, their thoughts, feelings, and actions. Grief is inevitable as people die and the circle of life is renewed. Betrayal is more of a reaction to an action. It is so intense and blinding that the mere idea of betrayal can turn the most intelligent and meek person into the most cunning and vengeful. Like love, grief and betrayal come from the heart. The levels of either can only be experienced in a first-person perspective. Everything else is just a reasonable facsimile. Hamlet suffered both grief and betrayal, followed by rejection, doubt and hallucinations. His story is tangled and weaved so tight that he, himself, could hardly understand. He had no time to recover from the former without being forced to deal with the latter. William Shakespeare walked us right into[A2] Hamlet’s psyche and held us captive while he slowly became unraveled. Hamlet is a just and believable character. He is of royalty, but still looking to fulfill his own destiny. Whilst abroad studying, his father dies. Hamlet is scarcely allowed to mourn his poor father, the King’s,[A3] passing before he is forced to deal with his replacement. Sadly, while still in the throes of grief for his father, Hamlet’s mother, the Queen, remarries – to her own brother-in-law. Creating a royally related family based on greed and deception. [A4] Hamlet is visited by a ghost that he feels resembles his father. The ghost informs him that the King, the new King, his uncle and step-father is a murderer and murdered the previous King, Hamlet’s father[A5] . What kind of consuming emotion would stir within after hearing such news? It has scarcely been two months since his father has died and Hamlet will find no solace for his grief. He cannot shake the apparition as a fluke. He begins to piece together the horrid plot and evil intentions of his uncle. Shakespeare allows us to see the level of Hamlet’s madness by providing long, descriptive soliloquies that unearth his true feelings of madness and disparity. In the most famous quoted line of all plays, “to be or not to be” (Shakespeare, p951) Hamlet shows us the path that his madness will take. We can see that he just recently harbored a wonderment and fascination for life and all of its nuances, but as of late, his thoughts have become less enthusiastic and more vengeful. He questions the motives of any man that chooses to continue to live and suffer at the hands of time, the hands and will of other men, the painful resonant tenderness of unreturned affection or the biased government[A6] . Hamlet starts a fast paced descent into the depths of his grief – confronting, questioning and offending everyone along the way. It reads like a modern-day television sitcom based on meeting and exceeding every possible limit. As if Shakespeare had a list of what if questions that would push and push until the breaking point[A7] . Hamlet’s uncle kills his father, marries his mother, denies him his true love, set[A8] him up to be deceived, to be swindled and eventually shipped away to bother no more. And in come the questions[A9] : What if the killer was his uncle? What if his mom married his uncle? What if he vowed revenge but stabbed the wrong person? Hamlet is ravenous with revenge. His thoughts and feelings get more erratic with each passing moment. While praying and asking forgiveness, Hamlet sees his uncle, at a disadvantage, but carefully decides that death while praying will not allow enough suffrage for his liking. Hamlet meets with his mother, to shame her and inquire about her reasoning and state of mind. He didn’t know it then, but he was being listened to. Upon hearing a noise, he impulsively stabs the councilor to the king, only stating “I know not: was it the king” (Shakespeare, p969)? 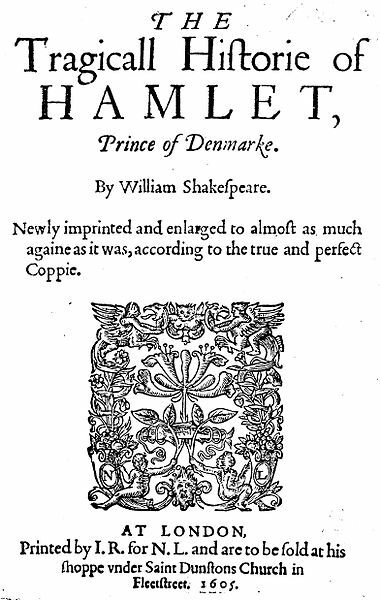 Hamlet’s power hungry uncle takes this as an opportunity to ship Hamlet off to England[A10] . After word of the accidental unnecessary death, the mayhem is rampant. Hamlet’s only love and the councilor’s daughter, Ophelia, loses her mind when she discovers that her would-be lover has cold-bloodedly murdered her father. Her brother returns from war to avenge his father’s death – but soon is grieving the loss of his sister. The conniving king plays his part by inciting the youngster to seek justice through the death of Hamlet and tries to ensure Hamlet’s death by poisoned blade or poisoned goblet. A fight ensues and nothing goes as planned. Hamlet is a character of much character. He is noble and intelligent, practiced and rehearsed in matter of thought and philosophy. Hamlet loses his mind, his philosophy and his entire sense of family when his father is murdered. While suffering this grief, Hamlet is prompted by a ghost to believe that his uncle killed his father. He sets forth on a turbulent and frantic journey towards the truth. But with every reveal, Hamlet discovers that not only is this travesty true, that there is more to be unearthed, to been seen and discovered and none of it can be denied. He is not given a chance to deal with any of it on his terms. He cannot come to terms with what he is being told before there is more to tell. He is not allowed to process and heal. He simply has to deal with it. Hamlet is a whirlwind account of how a young man loses his mind – and his entire family[A12] . Barnet, S., Burto, W., & Cain, W. E. (2011). Literature for Composition (9th ed.). New York, New York: Longman. [A1]Hi Tanisha, the title page meets the APA standards. Thank you. [A2]This is a thoughtful reflection on the concept of grief and betrayal in Shakespeare’s Hamlet. How may structure this paragraph as an effective introduction of your essay? You may find it helpful to review the 5-paragraph tutorial from Writing Wizards in the Tutorials & Guides section of the Center for Writing Excellence for more information about writing introductions. [A4]This is an important point. How may you turn phrase into a complete sentence? [A5]Your understanding of the central plot of this tragedy is remarkable. Thank you. [A6]Hamlet’s dilemma expressed in this analysis defines the heart of the tragedy. Your demonstrate a great analytical skill. Good job. [A7]This is an important phrase. How may you turn it into a complete sentence to enhance the clarity of your thoughts? [A9]Try to maintain a professional tone in your essay by avoiding the use of conversational words and expressions. How may you rephrase this expression to make academic? [A10]This is great retelling of the story of the Tragedy of Hamlet. [A11]You demonstrate an understanding of the sequence of the actions as they build up to the climax. [A12]This is a good essay, Tanisha. It demonstrates an understanding of the plot structure of The Tragedy of Hamlet and your view of the theme of grief and vengeance is thoughtful. You did a great job retelling the story. Your paper has a structure that is clear and easy to follow. Your conclusion is logical and flows from the introduction. Consider how you may structure your paper to address in some depth the key elements of the assignment rubric including the role of imagination in wiring and reading this play and Shakespeare’s use of literary devices and conventions of drama to his view of betrayal and vengeance. Consider also how you may use direct quotations from the play to support your views. Your title page format is consistent with the APA. Try to review the reference page format to meet the APA guidelines. Good effort. [A13]Please check the Reference and Citation Examples document in the Tutorials & Guides section of the Center for Writing Excellence for examples of correct formatting. Then carefully check your citations and references to be sure that they are formatted correctly.